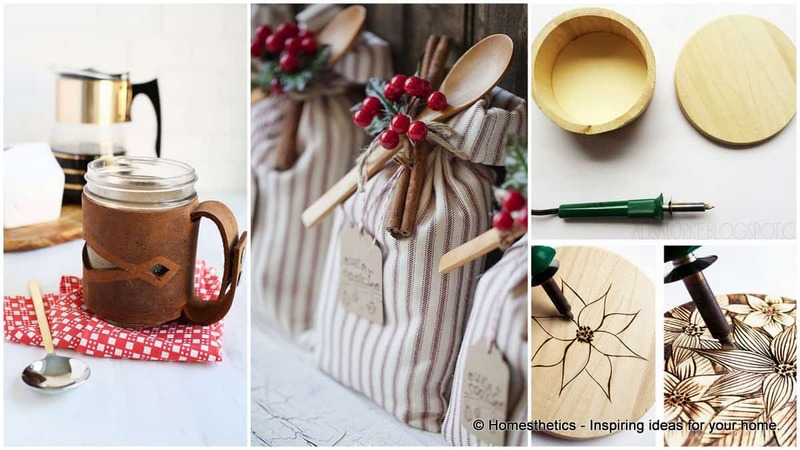 3 Canvas Painting Ideas You Should Definitely Take On | Homesthetics - Inspiring ideas for your home. 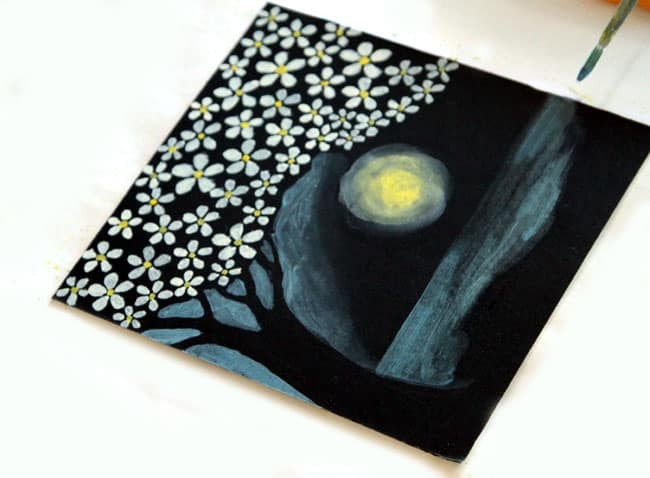 Canvas painting ideas represent a vast domain meant to inspire and allow one’s creativity to run wild and really express itself in different manners using a various set of techniques and materials. 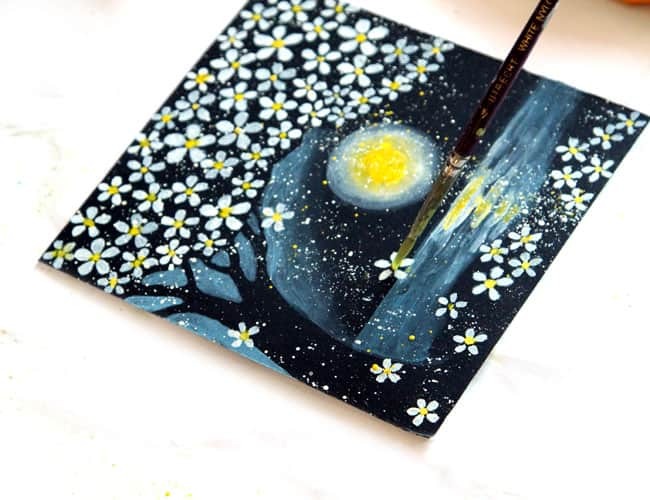 We have started yesterday pursuing this particular topic by setting down a few basic rules on easy canvas painting and today we continue our series with a 3 Canvas Painting Ideas You Should Definitely Take On tutorial which will help the beginner levels and more to dare and take on this wonderful art and even turn it into a relaxing calming hobby. 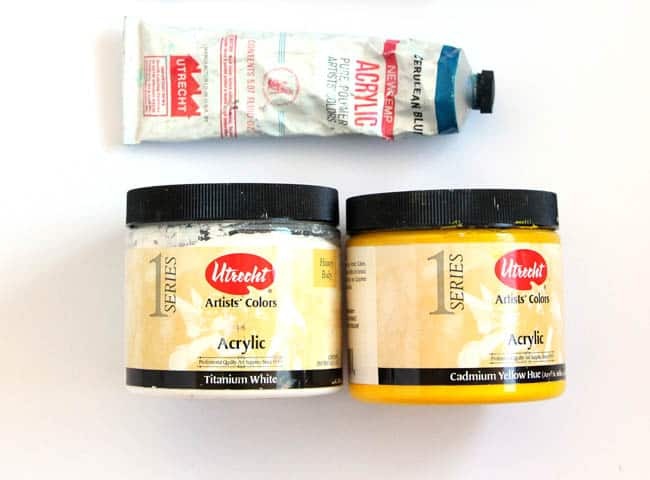 If you need some help on deciding which are the bests oil or acrylic paints for canvas painting, best acrylic palettes, best overall acrylic paints, best budget acrylic paints, best acrylic paint brushes or the best paper products for acrylic, Homesthetics is here to help! So we invite you to follow the step by step guides and really learn and understand the beauty this art field hides within. 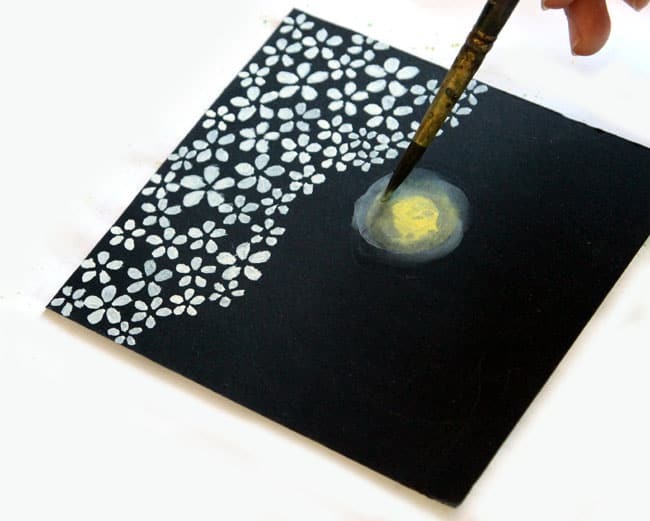 We shall present all of these 3 canvas painting ideas step by step for a better understanding of the process involved. 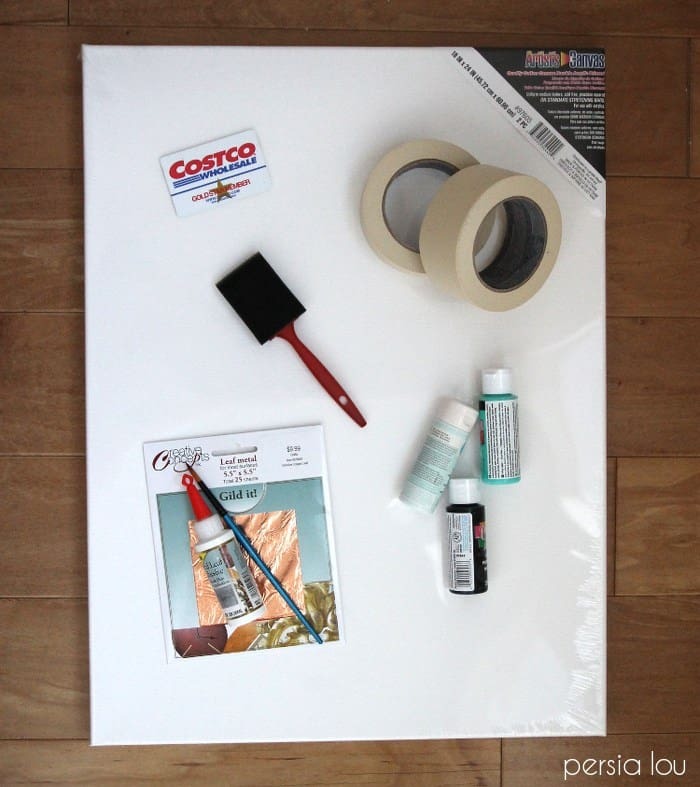 Each one is quite simple to grasp and has a low difficulty level ideal for canvas painting projects beginners. 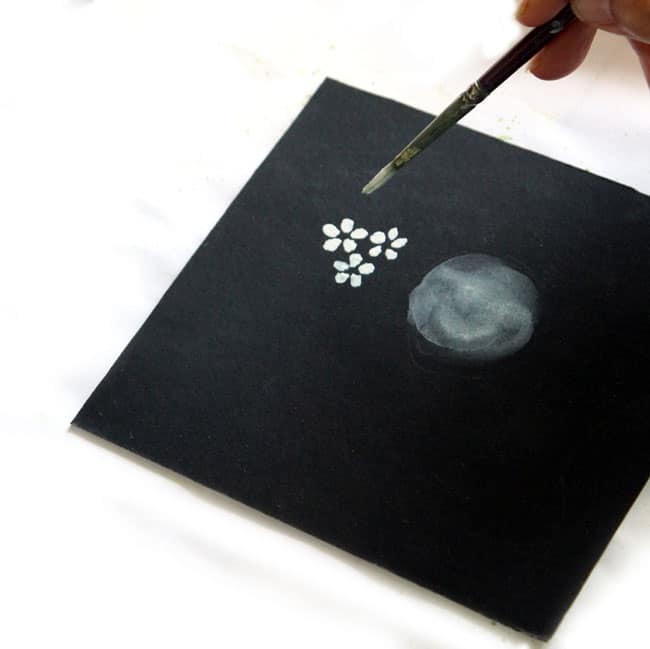 After deciding on your colored ground tone, although we do recommend a clean black one for his particular design, you have to position the key element central for your work which is the moon.A diluted sphere of white which is left to dissolve and spread on the canvas for an irregular shape is desired. 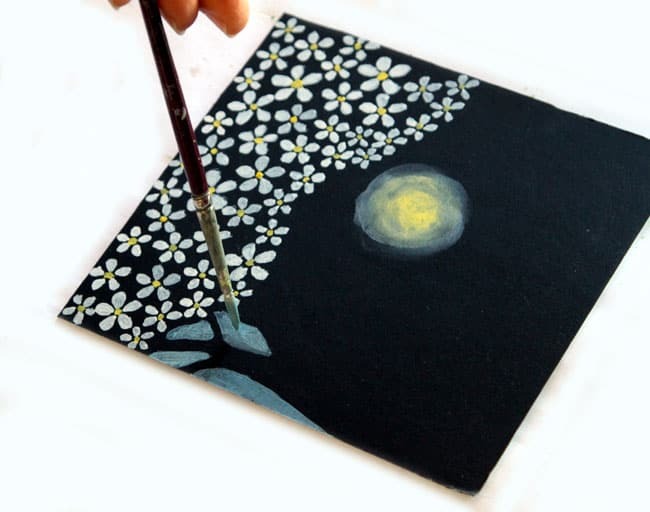 Star drawing the beautiful perfect little white cherry blossoms petal by petal. 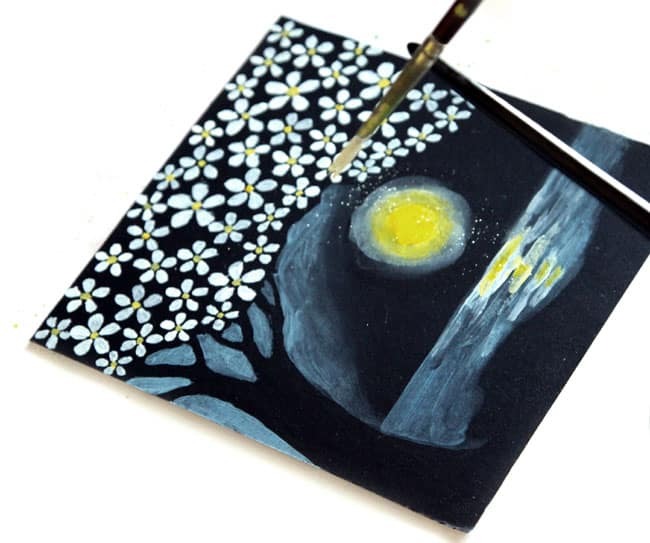 Take your time and do not rush into it.A stronger consistency of the white acrylic is required in order to obtain precision.Use a small brush for this particular task. 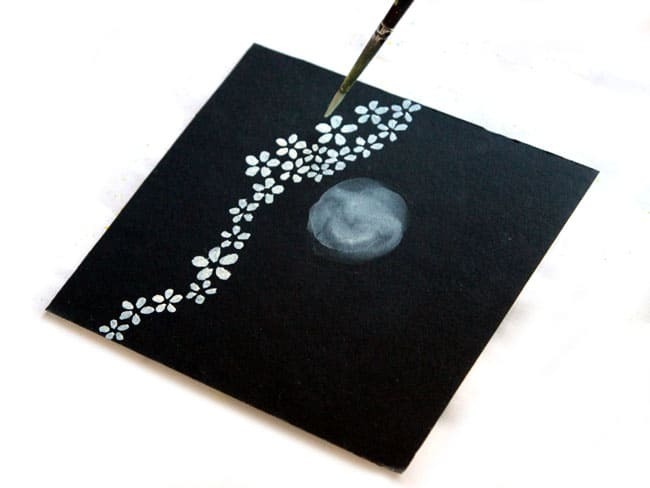 Create a tray of different sized cheery blossoms until you manage to fill the entire upper area of your canvas Trace a desired line and try to maintain it. Once e have finished with the white acrylic paint will continue with the yellow tones. 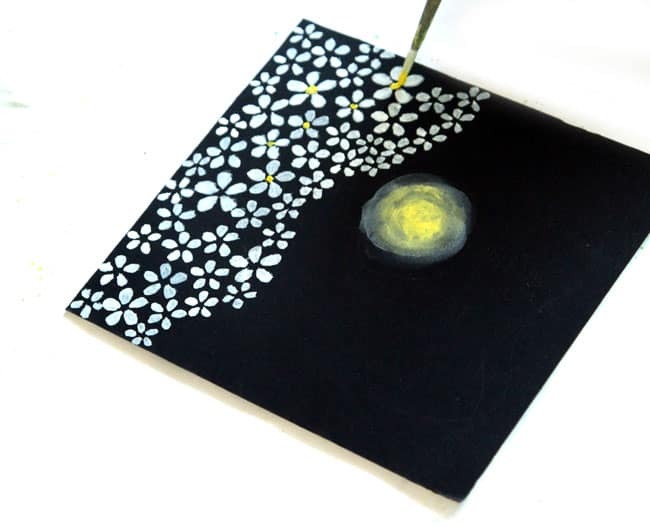 Add a center of yellow to your white serene moon and try and spread the color unevenly around the edges of the sphere.The yellow will add light and warmth to your cool canvas painting. 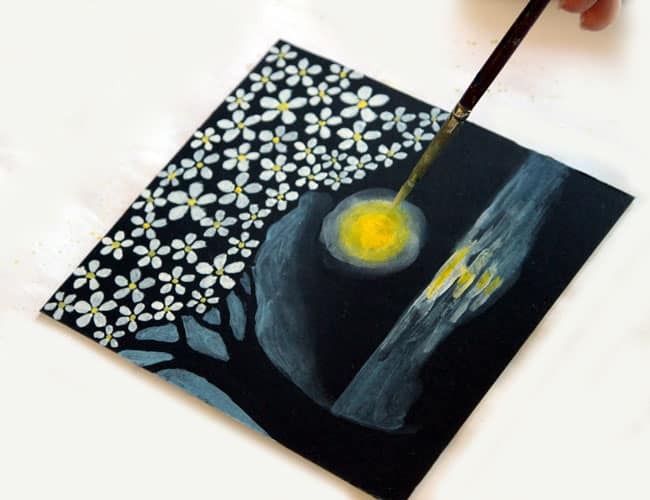 And because we have started using the yellow acrylic paint why not continue with it and fill in the center o your beautiful delicate cheery blossoms.Your canvas is beginning to take contour. We are now starting to create which will be the base of our cherry tree. 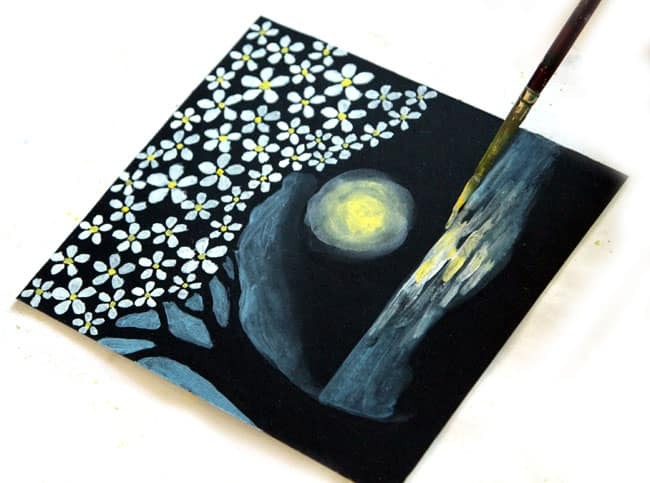 For this task we have chosen to use a mixture of blue white and a little bit of black acrylic paints which will mix into a bluish greish tone that will merge beautifully with the night theme.We have painted the inverted image of the tree, leaving the black ground color to create the trunk of the tree while the atmosphere got the bluish tones. The reflection has been created by using a layering of white and yellow tones. The moon has gotten another yellow addition, this time a little bit warmer. 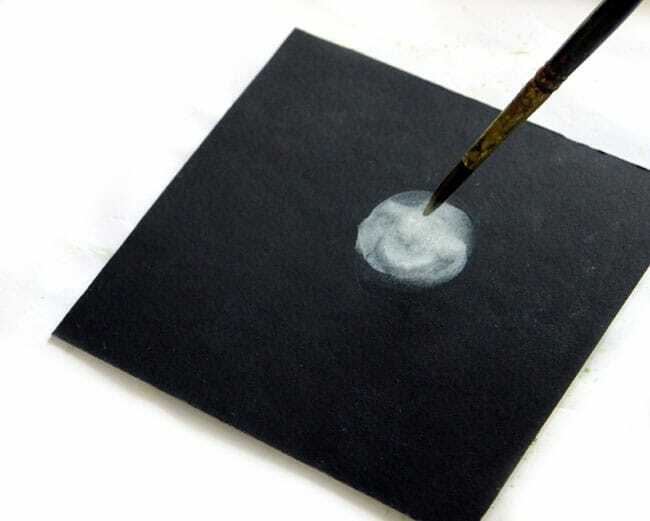 To create a stardust effect, we have dipped the brush in white acrylic and gently hit it with a pencil to obtain a beautiful splatter effect. To complete the desired painting, add a few cheery blossoms on the water as well and create thus the effect of falling flowers. 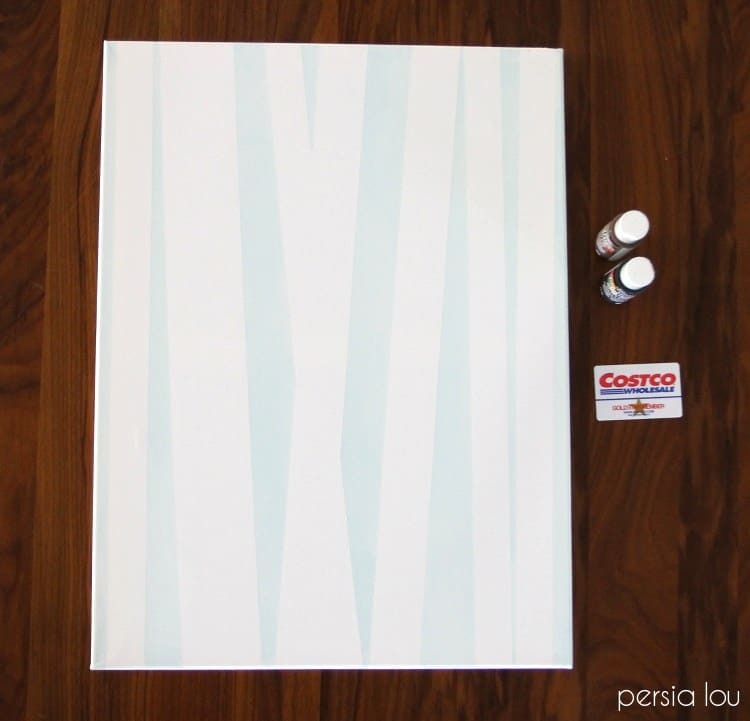 With this 10th step, your canvas painting idea has taken shape. The end result is a cool beautiful one you should definitely be proud of. 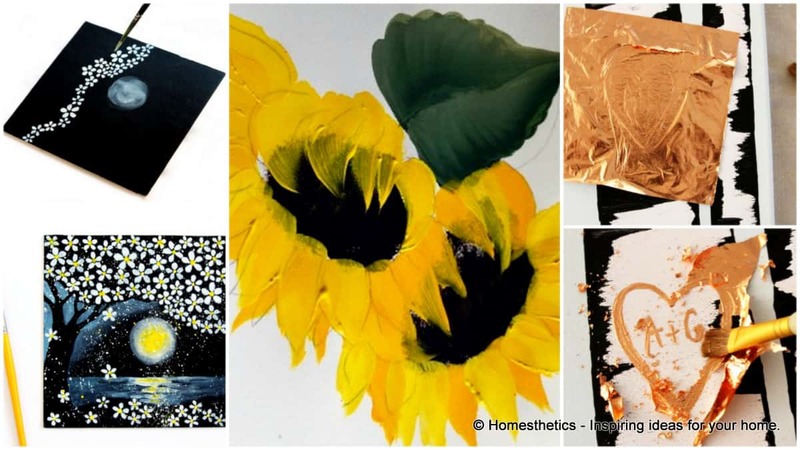 This tutorial will teach you how to create a simple beuatiful sunflower design within minutes which can serve as the basics for an entire flowery canvas painting idea project. 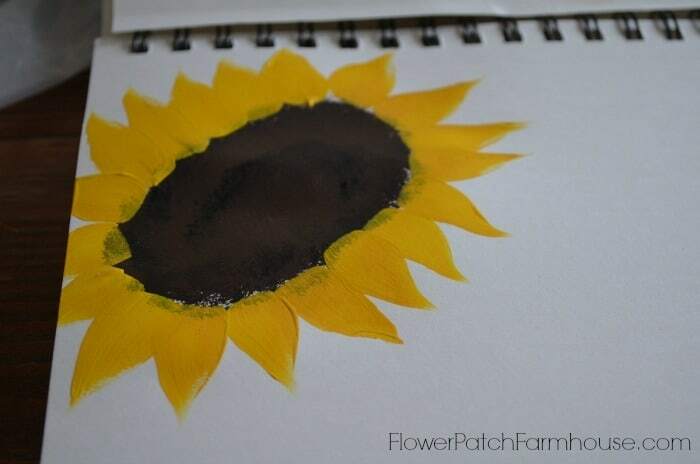 if in the previous tutorial we have decided on a black colored ground for our basis, this time will try and learn the basic technique of creating a sunflower on the plain clean white canvas board. We will start the project by drawing the center of our sunflower, an ellipse shaped center. 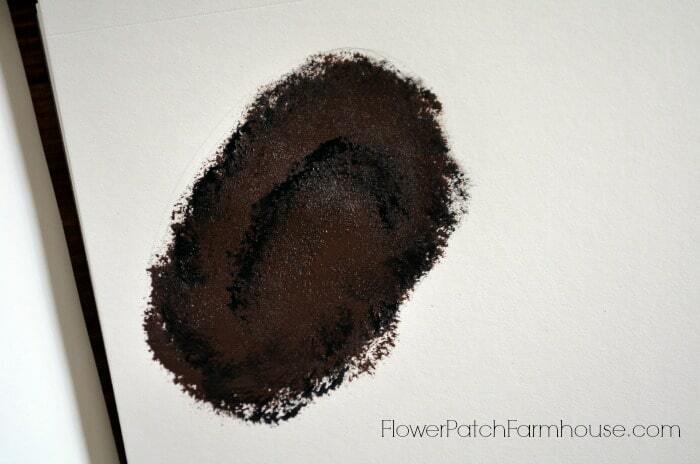 Choose your acrylic tones desired, a mix of black and maroon has been used in this tutorial. 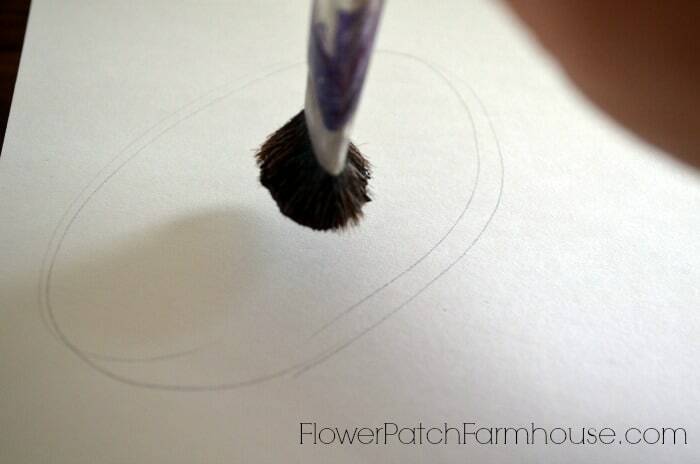 Use a rather large bushy brush for the center of the flower. Fill in the ellipse without taking care of respecting the exact contour set by you. You can observe the tones were not completely mixed before applying the paint. 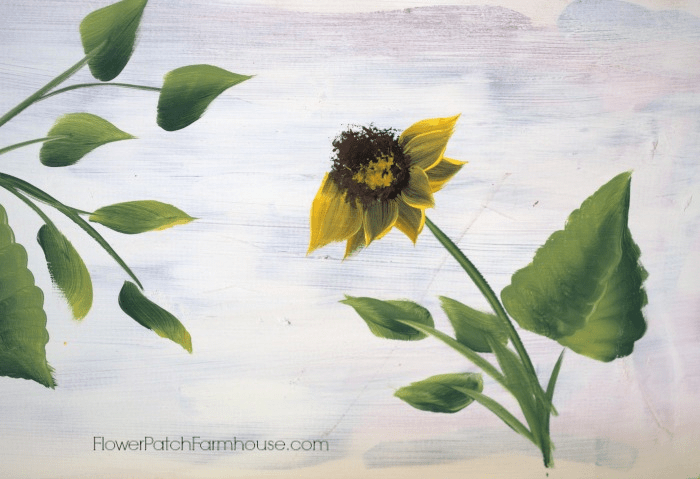 You can now start to add the sunflower petals. 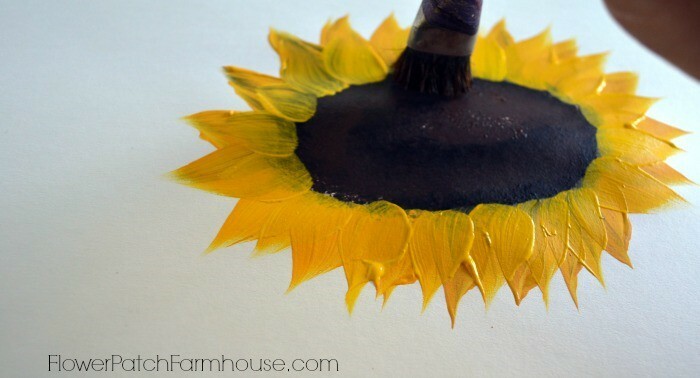 A bright yellow tone was used the create the distinct petals by using the flat side of a paint brush and its sides for the tip of the petals. 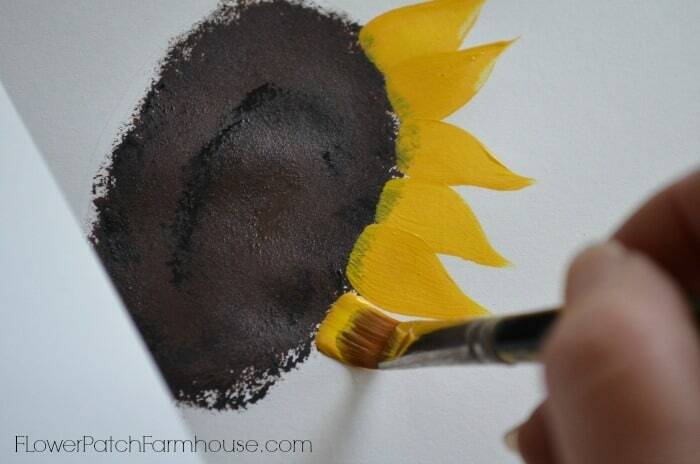 The first layer of petals is ready.It is preferable to add another layer of ocher or gold petals to add depth to your sunflower design. Once you have applied the second layer of petals clean the center of your flower to define your end creation. You can use this simple step by step technique to create a wonderful delicate flower composition. The creation below has used a purple white and blue mixture for the colored ground for a more sensible approach. The third and last tutorial on our list is one involving a mixed technique. 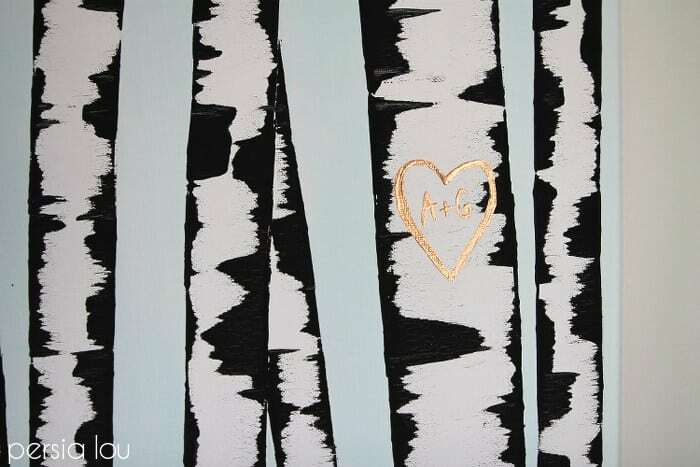 Masking tape, a credit card, a canvas and acrylic have been used to create a cool simple DIY birch tree wall art project.So let’s get into it. 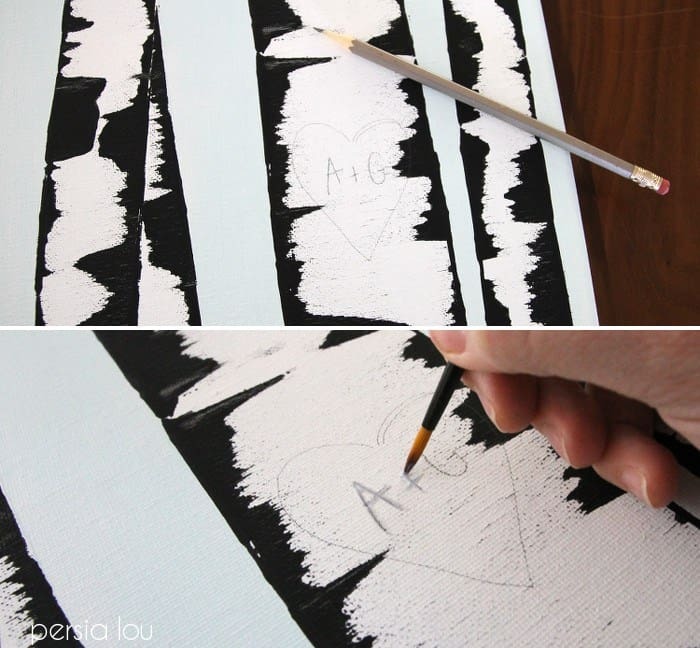 Start this canvas painting idea by creating your tree trunks on your canvas using layers of masking tape. Decide on the design from the very beginning. 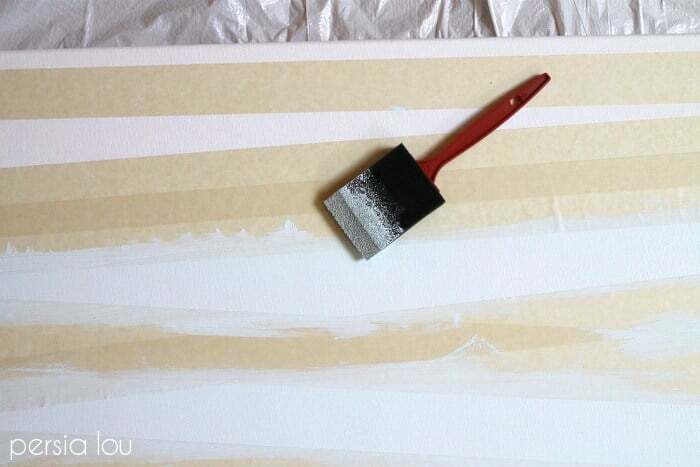 Using the sponge brush give your canvas a colored ground. This tutorial has used a light shade of blue that will contrasts beautifully with the dark tones of the trees. 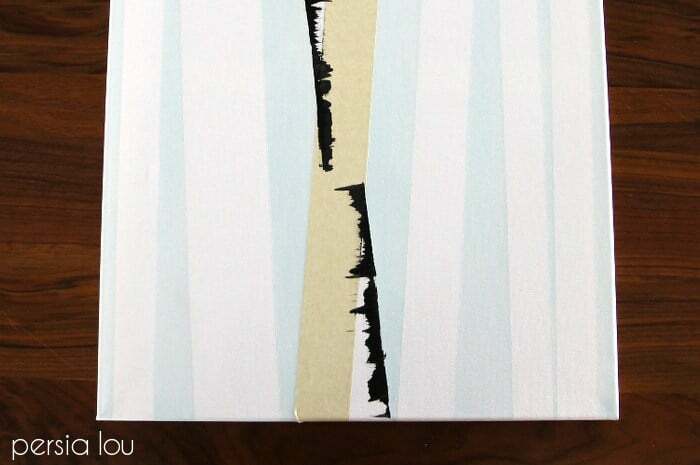 Remove the masking tape after your acrylic painted background has dried out nicely. 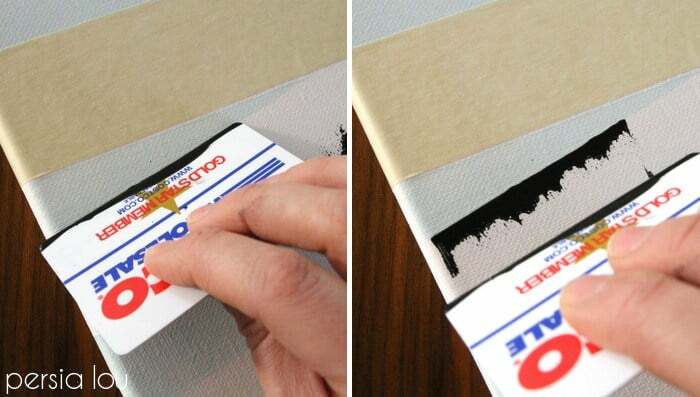 Using an old plastic card dipped in black paint drag push its edge on your canvas and drag it to create a diffed effect. 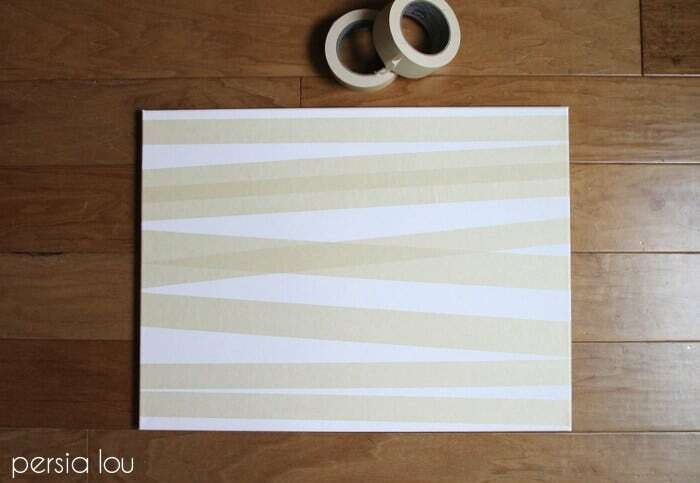 you can use masking tape if you want to be exact with your desired design lines. 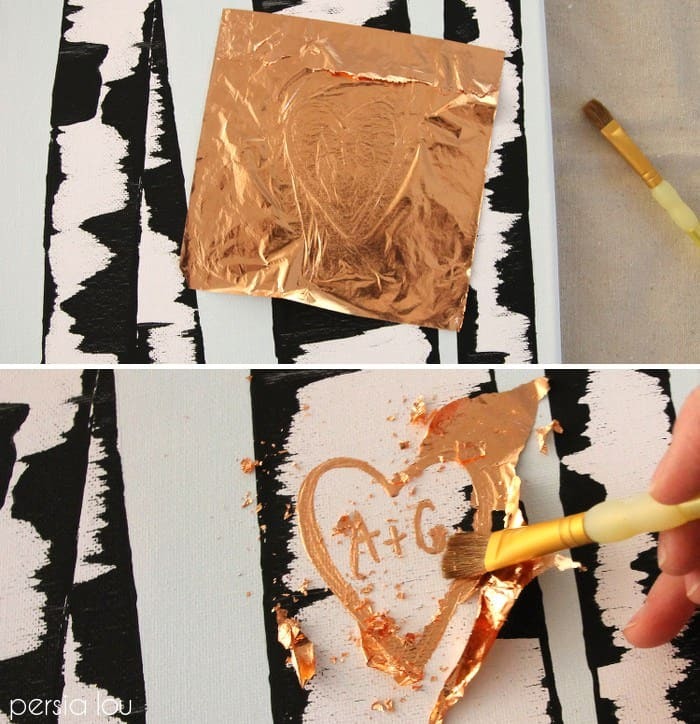 The final steps involve around adding a tree love sign on your creation.Start by drawing the heart and initials using a pencil then apply a thin layer of metal leaf adhesive. Let it dry until it becomes sticky enough to receive the copper leaf. Press it down let it dry and than clean the excess with a clean brush. The last step is admiring your canvas painting idea finalized and deciding where is the best place in your home to display it perfectly. 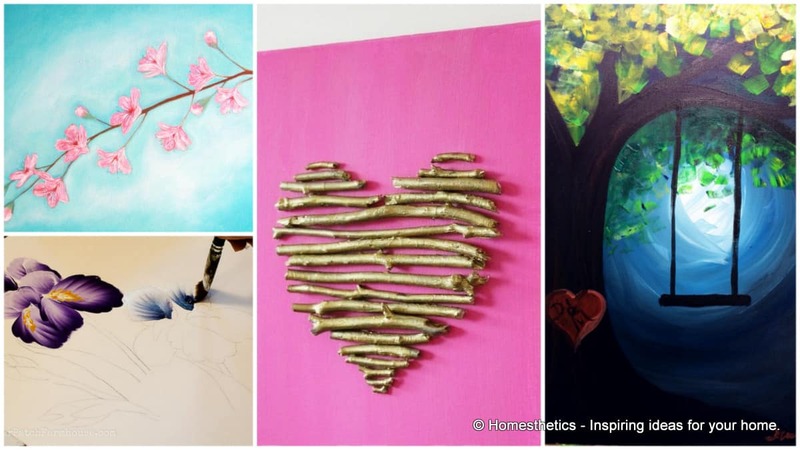 We hope you have found these simple 3 Canvas Painting Ideas tutorials as helpful and appealing as we have. We would love to hear your take on this subject in the comment section below as well as your own personal canvas painting ideas materialized already.